Stacy Tilton Reviews: Well Yes! I'll have that can of goodness! Well Yes! I'll have that can of goodness! Recently I've been trying out some new soups that have some unique ingredients like kale, quinoa, sweet potatoes, and barley. I have to say I'm quite impressed so far with the ones I've tried. The line is called Well Yes! and it's part of the ready-to-serve soups from Campbell's. There are nine different soups in the line all with their own unique purposeful ingredients. This is what actually initially drew me to the line. I always hate when my kids want me to buy soups that to me are really just empty calories to fill them up..I'm sure you moms know which ones I'm talking about without me even typing it. Well Yes! soups are made with carefully selected and sourced ingredients like chicken meat with no antibiotics. They also don't contain any artificial colors, flavors, ingredients or modified starches. And to finish it all off the packaging is a non-BPA lined can and recyclable! Now that's what I'm talking about when I say Well Yes! I'll have that can of goodness! • One-quarter of respondents (24%) confessed to passing off canned soup to dinner party guests as homemade. • 28% of people admit they’ve eaten soup shirt-less and 20% have eaten soup sans pants. AND one-in-10 have eaten soup without any clothes on! 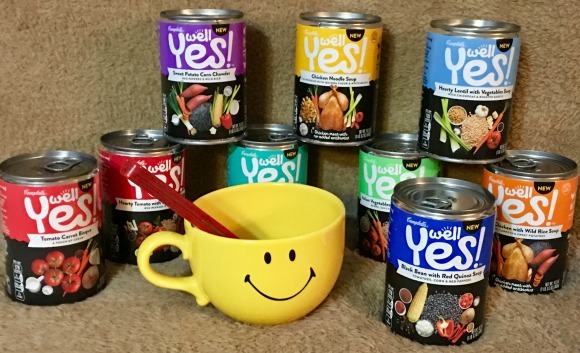 • 60% of respondents described themselves as soup lovers AND dog lovers, while only 46% said the same of being a soup lover AND a cat lover.